My previous posts about Natural Skincare on Etsy (click here & here) have been very popular so I decided to put together another one. Laila London - my attention was drawn to the beautiful jar and wooden spoon. This is bodycare which looks good enough to eat. A variety of scrubs and butters are available. Evy Jo & Co - Bath and skincare product that are organic, vegan and handcrafted in Montreal, Canada. I was drawn to the stunning photographs and elegant packaging. Pictured above is the Pink Clay mask and soap set. French Girl Organics - this brand boast an impressive free from ingredients list "Almost 100% VEGAN, ORGANIC or WILDCRAFTED, with ingredients grown on our Urban Farmstead in Seattle, others from farmer friends in the Pacific Northwest or around the world." As well as skincare French Girl Organics have a line of lip tints and perfumes which caught my attention. 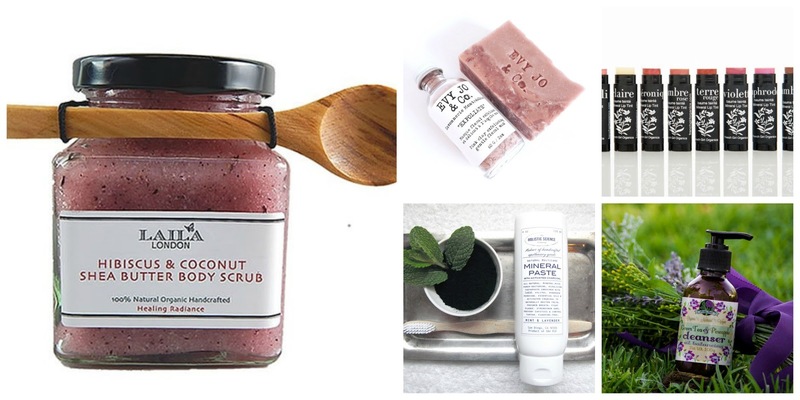 That body scrub looks delightful! You're absolutely right, just feel like eating it with the little wooden spoon. It must smell heavenly too! Ohh the scrub sounds divine! Batty's Bath has been on my wishlist for a while now and thanks for the brand introductions. I love shopping on Etsy and supporting small businesses. It feels like I am supporting people who truly care about what they put into their products. I love the looks of Holistic Science Co! I've also had my eye on Batty's Bath products.